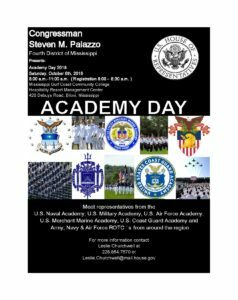 Presents: Academy Day 2018 Saturday, October 6th, 2018 8:00 a.m.-11:00 a.m.
Meet representatives from the U.S. Naval Academy, U.S. Military Academy, U.S. Air Force Academy, U.S. Merchant Marine Academy, U.S. Coast Guard Academy and Army, Navy & Air Force ROTC’s from around the region.